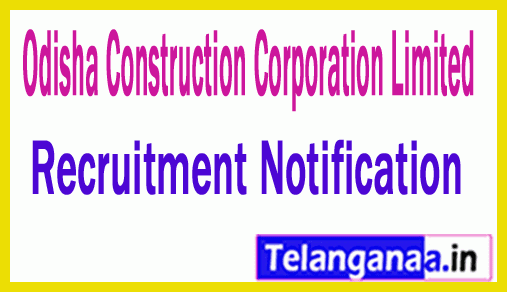 A newest career advertisement as OCCL Recruitment has been released by Odisha Construction Corporation Limited to inform the diligent and dynamic Job Searchers for 09 vacant posts of Office Assistant. Eligible Job seekers can apply for OCCL vacancy by submitting application form through offline mode before the time limit is 31st January 2019. Essential Qualification: Aspirants must have Graduation Degree / PGDCA from well recognized University / Institute according to post. Contenders who want to join this organization they should be in between 21 to 32 Years as on 01-01-2019. Relaxation in upper age limit will be as recruiting organization norms. Emoluments: Those contenders who will meet the required eligibility criteria for OCCL vacancies will get a monthly consolidated of Rs. 9000 / - as per the rules of the organization. Assortment of job finders for above posts will be based on their appearance in Written Exam and Skill Test which will be conducted by Odisha Construction Corporation Limited. Visitors to the Official Website to apply for OCCL and that is http://odishaconstruction.com. This will open a list of the latest openings and candidates who have selected the most appropriate link. After reading notification, contenders have to download application form and filled all requests in correct manner without any type of mistake. Appliers must Attach the copies of documents / certificates if required and recent passport size photograph. Once the application form filled successfully Job searchers should send application form, documents and certificates in an envelope which should be super scripted on top by "Name of Post Applied For ..................... .." at the address well sited below. Closing Date to Submit Hard Copy of Application Form is: 31-01-2019.